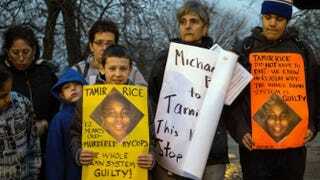 Protesters display sigs at Cudell Commons Park in Cleveland, Ohio, November 24, 2014 during a rally for Tamir Rice, a 12-year-old boy shot by police on November 23. Ohio’s 8th District Court of Appeals on Friday dismissed an activist group's effort to have a judge issue arrest warrants for two white Cleveland police officers in the shooting death of 12-year-old Tamir Rice, according to The Associated Press. The activists, calling themselves the Group of Eight, had submitted affidavits asking Municipal Judge Ronald Adrine to charge the officers based on a video showing that Cleveland officer Timothy Loehmann shot Tamir within seconds of leaving his police cruiser at a playground outside a recreation center. The activists relied on an obscure section of state law that says private citizens can file affidavits with a judge when they believe a crime has occurred, the report says. If a judge finds probable cause, charges “shall” be filed, writes the news outlet. A municipal judge ruled that affidavits submitted by the group and a video of the shooting were enough evidence to charge Loehmann and his partner, Frank Garmback, with misdemeanors. But the judge deferred the filing of charges to prosecutors, and the activists appealed. Now, county prosecutors have said a grand jury will determine if charges should be brought against the officers.